If your workflow includes a video editing program (Avid, Premiere Pro or FCP) then shifting from Aperture 3 to Lightroom 4 for what LR can do with video gives NO benefit. If you have a Retina Display then for the time being I think it’s actually worse as a video management program, so stay put. I’m writing this blog because I haven’t heard anything about this anywhere, and I stay pretty plugged in. You should know I’m a huge Apple guy (AKA fanboy) and have been for years. I’m an evangelist. I will go with what works though. This is evident by my choice to go with Premiere Pro exclusively over FCP 7 or 10. I made this determination long after the dust settled with FCP 10 fiasco. My choice was for the Adobe infrastructure. I wanted PS layers to know that I could choose to make video or photo layers in PS and still have those layers in PP. I wanted to shift a PP video into AE and come back seamlessly. As I went from point and shoots to DSLRs I went from iPhoto to Aperture. The way iPhoto stored RAWs didn’t work for me. I’ve used every nook and cranny of Aperture since. All my pictures start and end with Aperture. I import them, sort, rate, do lots of fine tuned editing, export for offsite storage, export for print, and eventually relocate originals to an external. Later when I want to look at these files again I just connect the external storage and I can see all the modifications. If Photoshop is needed for heavy lifting I send it out to photoshop and see changes in Aperture. The PS file (tiff) storage is handled by Aperture. It all works. IF I’m shifting to LR for video workflow this is what I expect. As it stands I have to export the video outside Aperture to even open them in PP. I list this first because I saw this as what would save me the most time. Choosing In and Out point inside PP is pretty clunky. This is a feature not available in Aperture so was excited to try it in LR. If you choose in and out points in LR and then open the same video in PP they are not there. This is not a bug. The only way to get this to happen would be to export your video using LR. Then import these new videos into PP. This extra hassle with data management is not worth the hassle to me compared to the hassle of choosing in a out points in PP. This is especially true since my SSD is getting full. Same story. I was excited to do soft editing in LR and save some time in PP. One example would be to use the Color Checker Passport to set white and black points and white balance. Same issue though. I can do these things in PP and can cut and paste between videos if the lighting was constant. If doing it in LR adds a step having an extra export then it doesn’t save time not having to do it in PP. A photo or video management system is only half as good without Retina. Sifting through video looking for which were in focus just wasn’t working for me in Lightroom 4. Oct 2nd 4.2 came out and surprised many that LR 4 didn’t upgrade to Retina Support. PS and PP had by now. Now with Nov 8th’s 4.3 update it’s not mentioned again. This is a very big deal. OK, so admittedly I’m extremely spoiled but there is no way I can do anything with photos on a non-retina display. There is no way to describe how useful having your screen be able to show more pixels on the screen. I described that in this post. Basically it’s like trying to watch the newest action movie on a SD old CRT TV using VHS. 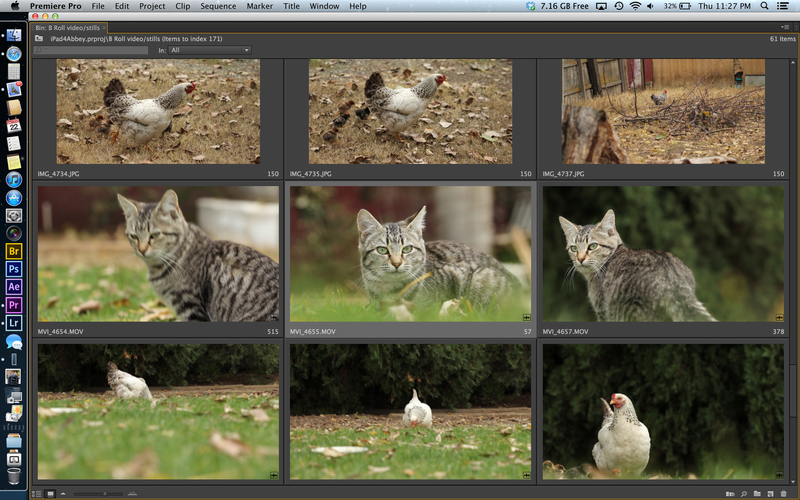 I’ve been using Premier Pro’s Retina enabled software now for months and I’m equally spoiled. I tried rating with LR tonight and found myself constantly frustrated and wasting lots of time. Then choosing in and out point was basically impossible. Of course I use the word impossible loosely. I’m sticking with Aperture 3 for now. Once Retina support comes out I’ll think about it again. I’ll need to divorce my video import from my photo so that video import outside of Aperture’s library so they are accessible to LR and PP. 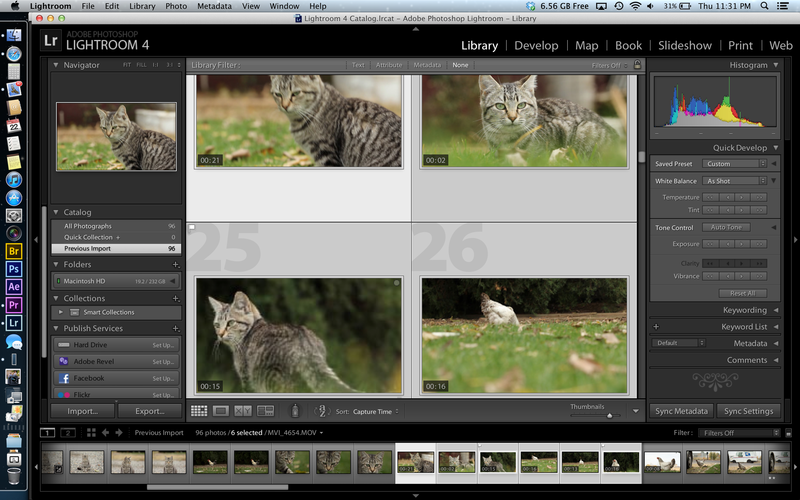 Lightroom 4.3 came out and I wrote a post about why now I’m switching to LR. Video in Aperture has been driving me crazy for years. I’ve been seriously thinking it’s time to give LR a go. c. be more stable in its ability to handle formats, I often have two videos from the same camera/session and aperture will say one of them is ‘unsupported’ ??? My friend, I’ think both are bad at managing videos. Where are the videos going next in your workflow? Is Aperture or LR an intermediate for some other program? Premiere pro does b. and c. But doesn’t organize the videos at all. I have no clue why they don’t have LR catalog available to Premiere Pro.